Pictured at Sun Life Financial are the finalists. Two WIT students have been presented with awards for innovational an enterprise in an annual event which sees 10 students showcase their undergraduate projects at Sun Life Financial. 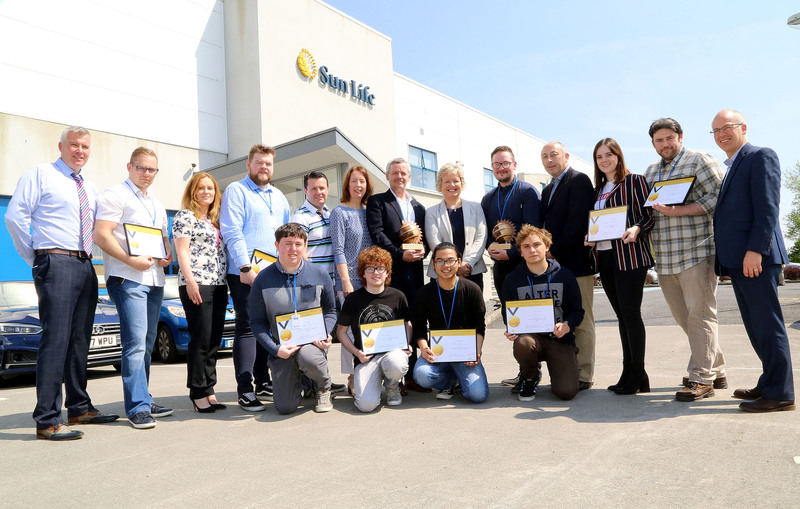 Waterford based Sun Life Financial is the leading IT employer in the South East where approximately 400 IT professionals provide technology solutions for Sun Life's US employee benefits business and technical solutions for its global workforce. Having started in 1998, the Waterford site is this year celebrating 20 years in operation. Originally set up with a brief to supplement technology teams in the US and Canada, the addition of high calibre IT professionals has allowed the Ireland team to evolve and become a technology cornerstone servicing Sun Life's clients. "The ability to attract, grow and retain top IT talent is the driving factor behind the evolution and growth of the Waterford Sun Life office. The relationship we have built with Waterford Institute of Technology has greatly helped us on this journey. We have collaborated with WIT to develop two Masters Programs and a Higher Diploma in Business Systems Analysis to afford our existing team the opportunity to upskill in the rapidly changing world of technology. This, along with WIT’s commitment to regularly upgrading their courses to stay at the forefront of technology, allows us to continually develop our talented team in Waterford. In fact in the last year WIT has also expanded their scope of delivery allowing up to offer one of their Masters programs via virtual technology to our offices in Boston and Kansas City – so WIT is now helping us to grow and retain our talent in the US also,” explained Karen Burns, General Manager of Sun Life Ireland and AVP of Human Resources. “The fact that over 60% of our team in Waterford are either graduates of WIT, or have continued their development with a post-graduate programme in WIT, demonstrates the relevance and interest of their IT programs to IT professionals. So these awards are just a small way that we can give something back to WIT and their students," Burns added. Two outstanding students picked up the annual awards: the Innovation Award for a project that demonstrated uniqueness went to David Walsh for his project “Bio-metric Key Generation for Financial Transactions” and the Enterprise Award for a project that demonstrated commercial potential went to Eoin O’Mahony for his project exploring whether a real-time web application can improve the understanding for parents regarding the development of their child in special needs education. The standard of competition was extremely high with 10 finalists invited to showcase their projects at an exhibition at Sun Life’s office in Waterford. These have been selected from a number projects submitted from final year honours undergraduate projects. Speaking at the awards ceremony Dr. Padraig Kirwan, WIT’s Head of Department of Computing and Mathematics, also acknowledged the relationship between WIT and Sun Life Ireland. “The relationship with Sun Life Ireland is very special to WIT and we are very grateful for all the support throughout the years, Dr. Kirwan commented. He also commended the graduates on the standard of the projects and highlighted the willingness of the students to combine the skills and tools learned in the classroom with those from outside the classroom. He encouraged them to continue with this openness to learning new skills and tools as they go through their careers. Visiting from the US for the event Orla Daunt, Associate Vice President of Business Architecture and Business Systems Analysis acknowledged that selecting 2 winners cannot have been an easy task due to the quality of all projects presented. “The quality of the projects presented was impressive especially as they focussed on providing solutions for issues experienced in the real world. Ms Daunt also added her appreciation for the partnership with WIT. "Huge credit must be given to the close unique relationship between WIT and Sun Life Ireland. This is not always the case in other organizations”. Ms Daunt planned to take back the experience to Sun Life US and hopes to emulate this relationship in other sites in the future.